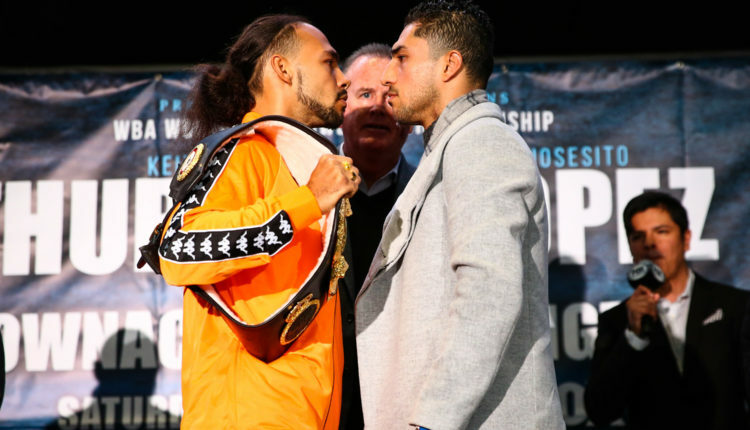 On a rainy Thursday in Brooklyn, Keith Thurman and Josesito Lopez spoke to the press from Barclays Center, two days before they face off in the Brooklyn venue for the WBA welterweight title. “It’s a tremendous feeling to be back in this position,” Thurman told the press from the Atrium at Barclays Center. “I’ve been to several fights in my time off and it’s felt like a lifetime. Saturday night, the champ is back. Brooklyn, we’re here. In Thurman’s first fight since his March 2017 win over Danny Garcia, “One-Time” admitted that he’s a bit nervous about his first fight in 22 months. “There’s always a little level of nerves for a fight, but it’s mostly anticipation. This is the world class level. I’m proud to be champion and I always want to be champion. The nerves are very natural, but they are not overpowering. I like to carry some nerves with me for each fight,” the champion said. “I can find so many avenues to win. Josesito Lopez is a good fighter, but he’s like swiss cheese, he’s got holes throughout. It’s only a matter of me exposing them round-by-round. “There shouldn’t be any hesitation in my game. We took this fight because we’re prepared. If anything was to occur, like if I were to feel some bumps and bruises in the fight, people have seen me fight through hematoma and some hard shots. I’m a tough egg to crack. No matter what shape I’m in, when it’s time to go to war, we fight. As for Lopez, who is no stranger to world championship challenges, he’s ready for the battle ahead of him on January 26th.”I’m always in tough battles because I don’t shy away from them. I’m in a tough fight this weekend but I’m more than ready for it,” Lopez told the press on Thursday. “Like any boxer, my confidence comes from my preparation. I feel like I’m at the championship level. I prepared well and I’ll have no excuses at the end of the night, no matter the result. “In preparation for a fight like this, you have to look at bad habits and mistakes your opponent has made. You can’t find a losing fight with Keith, but he’s been in fights that have shown some flaws that he has in his game. “I don’t know if Keith is overlooking me, but whatever the situation is, it will show in the ring. I’ve prepared for the best Keith Thurman and I’m prepared for Saturday night.